Performed by actress/writer Rani Moorthy. 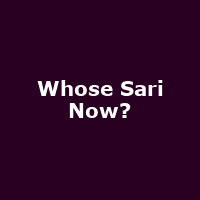 Whose Sari Now? Is the funny and poignant journey of one sari handed down, handed over and handed out to the characters in the play. Through each character's relationship with the sari, we get a glimpse of the myriad ways in which the garment impacts the lives of women across boundaries and generations."